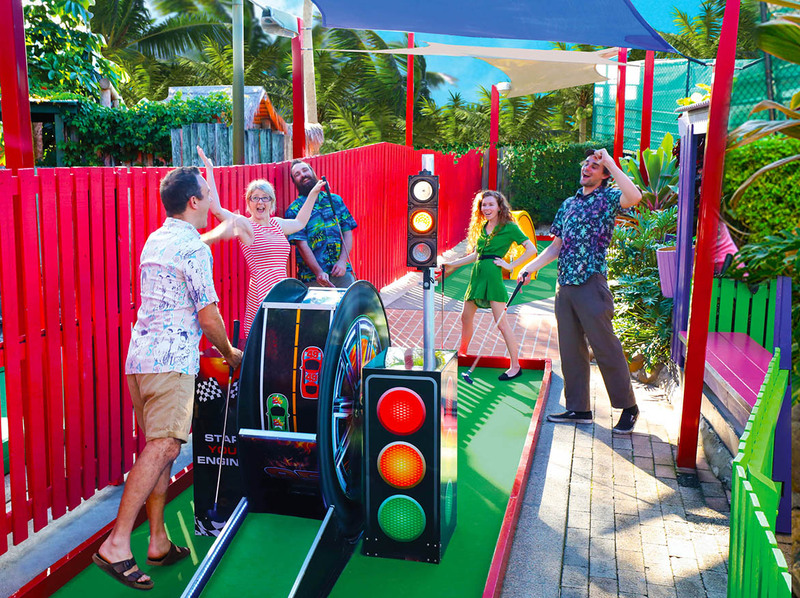 Putt Putt Mermaid Beach is the ultimate mini golf experience on the Gold Coast. Discover a hole world of fun with three themed 18 Hole Courses, games arcade, 19th hole refreshments, barbecue zone and free onsite parking. Take a walk on the wild side on the tropical Jungle Trail, get amongst colourful characters and tricky motorised obstacles on Fun Run and escape to a tropical oasis playing Waterways. Tee up any time with no booking required. Holes of fun for everyone! For an easier way to score your game, check out the Scorecard App available free at the iPhone App Store or Google Play Store. Tee up any time with no booking required. Suitable activity for all ages and skill levels. Centrally located on the Gold Coast Highway at Mermaid Beach, just a 10 minute drive south from Surfers Paradise and 25 minutes north from Gold Coast Airport.